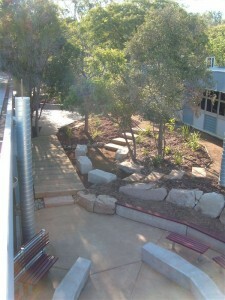 The Sustainable Architecture master plan design phase was the first step of the procedure to create a more sustainable environment for the Mt Crosby School. The design gives a holistic view of the space and is an essential base for discussions to guarantee that the outcome will meet all of the set expectations. The design will ensure the total integration for future developments and investigations, opportunities for new projects and a catalyst for projects and grants. The major step in this project was providing the client with a sustainable architecture master plan that will compliment the current school design to create a sustainable, warm, inspirational and social environment. We ensured this by the corporation of people and school growth, landscape, future buildings, and opportunities for solar, water solutions, rehabilitation, playgrounds and cooperation. The Sustainable architecture master plan ensured all of the clients objectives are met to be on track with becoming carbon neutral for a sustainable future. All of the sustainable construction work will have a set of objectives that makes the construction a nature-friendly one. – Also needs water – sink etc. All buildings need shade – as in awnings, screens, use of natural light, reduction of fluros, better ventilation. – Needs better ventilation and is very cold in Winter. – To have softfall put around trees on bank with name of Mt Crosby picked out on it. This project showed Sustainable how important master planning is when creating long term sustainability in a space. The Mt Crosby School had other projects completed previously on the school grounds which were not as fruitful, because they only offered short term solutions and did not think about a planning 5, 10, 15 or 25 years ahead. The plans put in place by Sustainable have ensured the money which the Mt Crosby School spent on upgrading their main areas will be enjoyed by staff and students in the future.